The right planner is a tool that cannot be beaten! I firmly believe that, though I can only speak from personal experience. A planner allows you to structure your time around your priorities, can keep you on track when you need it to, and can be a go-to resource for many different areas of your life. As helpful as they are, when it comes to choosing a planner there are so many options to consider that it can be quite confusing. Large or small? Ring-bound or disc bound? Coil or hardcover? DIY or premade? 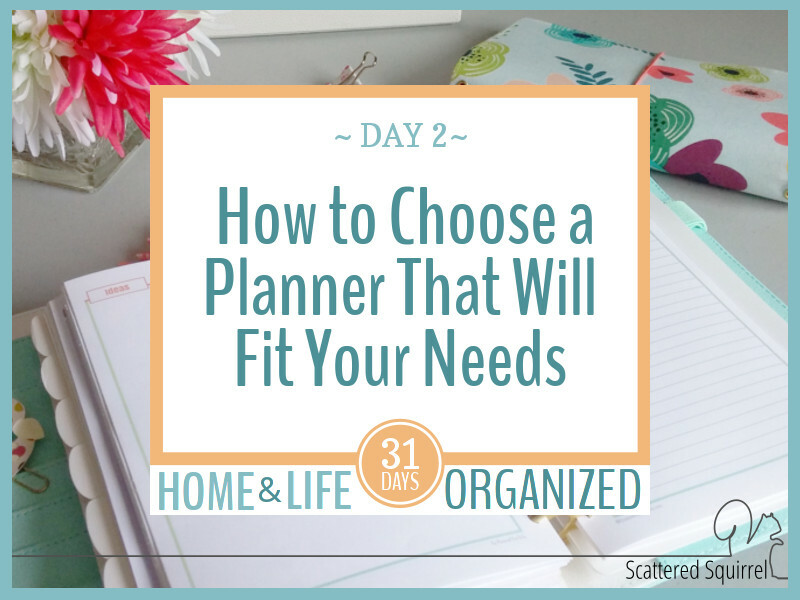 The options can feel overwhelming at times, so today I want to share my tips for how to choose a planner that will fit your needs. There is nothing worse than investing in a planner only to find that it ends up sitting on the shelf collecting dust. Some of the planners out there are not cheap.It can be hard to figure out where to start when you’re trying to choose a planner. There are a ton of different options out there, even if you like to DIY your planner like I do, the options are still endless. Thankfully, there is a way to narrow down those options to make it a little easier. The function of our planner is the first thing we need to think about, because in many ways, it will determine the next two steps in the formula. It’s hard to know how to choose a planner when you don’t know what you’re going to be using it for, where you’re going to be using it, and how often you will need to access it. My first I categorized my planners into one of two broad categories – reference and action. These are the ‘what’ part of the function. Things like my home management notebook, one of my blog planners, and my kitchen binder are examples of my reference planners. These are planners that hold information I need to keep or access. I may or may not use them frequently, but for the most part, I’m just looking up information in them. My main planner, work planner, and traveler’s notebook are examples of my action planners. These are the planners where I am constantly writing in them or flipping through them, checking in with them, in short – these are the ones that get used every day or at the very least, every week. Next, I think about where I’m going to be using the planner. If it’s a reference one, chances are pretty good that it’s just going to stay at home. If it’s an action planner, I need to decide if it’s something that I’m going to need when I’m out and about, because if I’m taking it with me when I leave the house I might need to look for a smaller, more portable size. Where the planner will be used, plays a big role for me in determining the next part of the formula – size! This is the area that I find the hardest to make a decision on. Too small and it can be hard to find the right set up for what you need, too big and your planner can become really cumbersome and hard to use. For the most part, personal preference plays the largest role in this choice, but there are a few things to keep in mind when picking your size. how many pages do you need to keep in it? Smaller planners might require more pages to keep all the information you need. how large is your writing? If you’re like me, and your handwriting is on the larger side, smaller planners can present a bit of a space challenge. how much do you need to write down? If you don’t have a lot of stuff going on each week, or you just want a planner where you can quickly jot down notes or ideas, a smaller planner might be the ideal choice for you. Because this series is about creating planners, I picked the sizes based on the most common sizes of ring and disc bound planners. 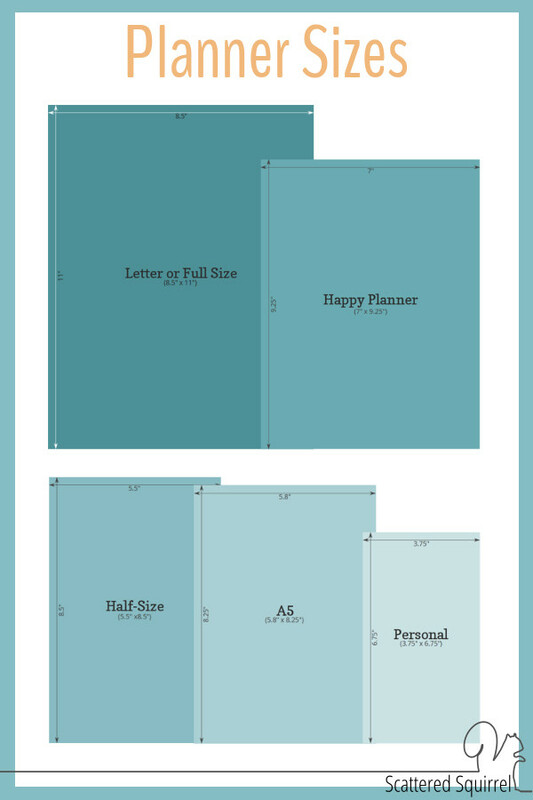 I included the Happy Planner dimensions because I’ve been told that if you print the full size printable at 80-85% they will fit in the Happy Planner. All the printables I’m sharing in this series will be either full or half-size. 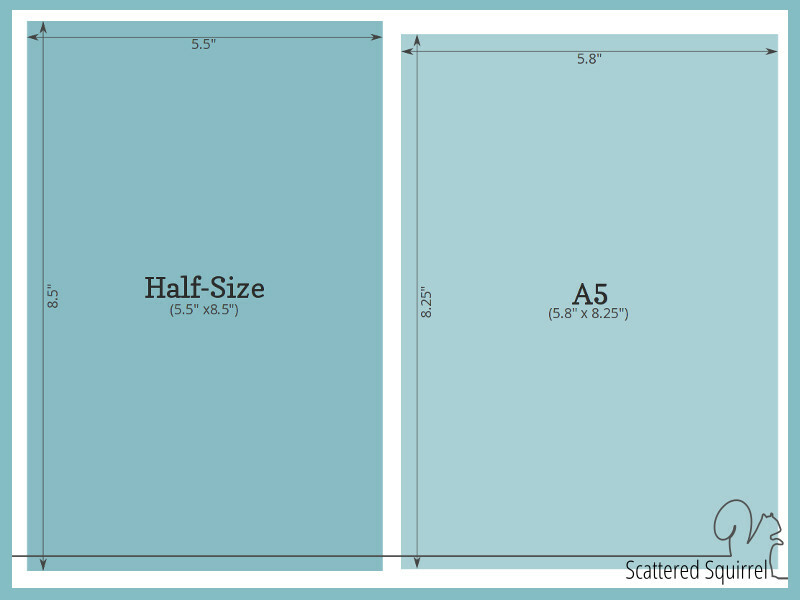 I get asked on occasion about the differences between the half-size printables and A5 planners. as you can see in the picture below they’re close in size, but not quite the same. 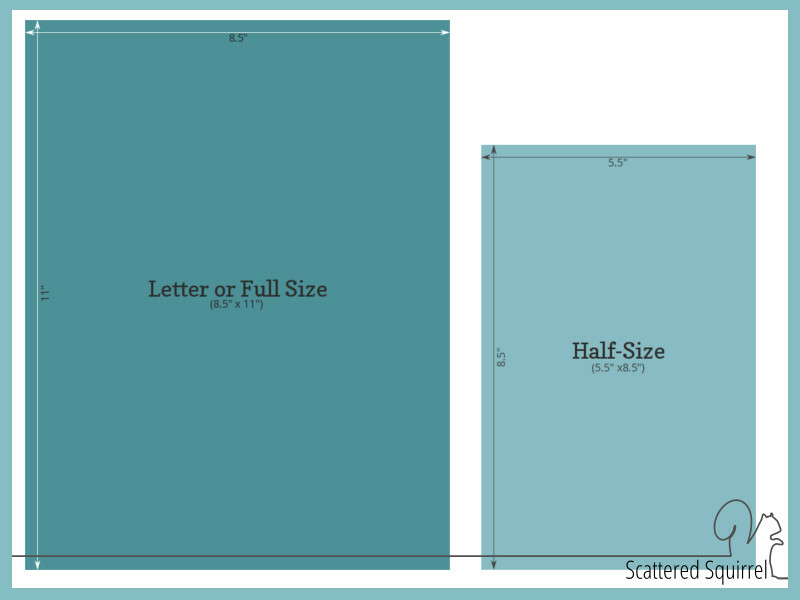 My half-size printables are literally, half the size of a letter piece of paper. That makes them a little taller and little more narrow than an A5. However, it also means less paper is used in printing, less trimming is required, and for the most part, the half-size printables will fit in an A5 planner. Currently, my favourite size is the half-size or A5. It’s a very versatile size. Large enough that I don’t feel cramped when I write and small enough that it’s easy to bring with me if I need to take it when I’m out. If you’re still not sure about the size, try printing out a few printables and using them for a bit. Or trim down some scrap paper and use that. Test drive the sizes and see what works best for you. There are a variety of binding options out there, but for the purpose of this post and series, I’m just going to focus on the ones that work best for DIYing your planner. Just like with choosing the size, the binding option you choose is a completely personal preference. Ring-bound binders and planners can be found everywhere at all price points. They make it easy to customize and change out your planner to suit your changing needs. Not only that, there are a ton of accessories on the market for them as well: everything from dividers to pockets. Disc-bound planners are slowly gaining in popularity. They offer all the flexibility of a ring binder with the ease of use of a coil bound notebook. Though there may not be as many options out there right now, you can still find a variety of add-ons for them as well, especially if you look on sites like Etsy. With either of these binding options , you will need to invest in a hole punch. The one I use for my disc bound planners is the one from Staples. I’ve had it for almost 4 years now, punched at least 2000 or more sheets with it, and it still punches just as well as it did the day I bought it. I couldn’t be happier with it. It is a bit of an investment, but it is will worth it. When you boil it down like, it sounds so simple. It takes some time, and it takes some trial and error, but in the end, you’ll find the one that is right for you. My final tip for how to choose a planner that is right for you is to start with a cheap option. Planners can be very expensive, so before you invest a lot of money in one, if you’re not sure it’s the right one, choose a cheaper option. Grab an Arc notebook from Staples if you think you might like disc bound, but aren’t sure. Michael’s has a line of personal size planners that aren’t too expensive if you think you might want something smaller. If you’re trying to decide between full and half (or A5) size ring binders, grab a binder or mini binder to start with. If you like them, and the size is right for you, then start shopping for something a little nicer and a little more you! If you find out they aren’t the right size, at least you’re not out a ton of money. Choosing a planner can be tough, but as long as you keep the purpose in mind, it doesn’t have to be too confusing. Remember that only you know what works best for you. It doesn’t matter if it’s not what everyone else is doing, as long as it works for you that’s what matters. If you have any questions about how to choose a planner, be sure to drop them in the Facebook post below. I’m thinking the first live Q and A session will be next weekend some time, so if you have a question don’t be afraid to ask! Previous Post: « Home and Life Organized – 31 Days of Planner Fun! Hi!! LOVE your website! I have a “mini” happy planner. It looks like it doesn’t fit into any of the dimensions listed above. Any suggestions for how to print any of your printables to fit? Thanks so much! I haven’t had a chance to check out the mini Happy Planners in person yet so I’m not entirely sure. I know they use a unique size for it rather than a more standard size. Your best bet would probably be to try printing the half-size ones at a reduced size. In your printer settings there should be a place where you can select what percentage to print at. I don’t know how much you would need to reduce them by though. I’m also not sure if you’d be able to print them double-sided doing it this way. I have used your printables when I couldn’t find a planner to fit my needs. However, I found a 2-year Happy Planner kit for a really great price that I now use. Your tips are great, because those are the top 3 things I think about when looking for and purchasing planners! I used to always have smaller planners, because I always carried them with me. I don’t take the Happy Planner anywhere – it just stays home because of it’s bulkiness. But at the moment, it’s working for me. I need the extra place to write my lists!